There’s a well-known Leitrim piper who was once offered a morning cup of tea by the lady of the house, whereupon he played this tune and afterward said “that’s called ‘When sick is it tea that you want?’” She got the message, and brought him a whiskey straight away. 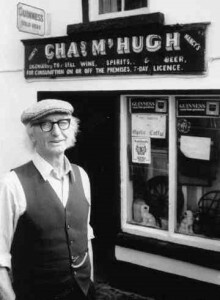 Packie lived, worked, and played the folk scene in London during the 1960s and 70s. Now, if you’re so inclined, and opposed to rhetorical questions, you may either regard “tea” as a sociable euphemism, or think of tea as actual medicine (like Prashanti de Jager). In addition to his autobiography Recollections of a Donegal Man (1989), and his tune book A Dossen of Heather (1998), there’s a collection of stories he commonly tells, My Friend Flanagan: tall tales told by Packie Manus Byrne (1996).